May is a very memorable month for all as we remember all those who made the ultimate sacrifice for our nation. Three years after the Civil War ended on May 5, 1868, Major General John A. Logan, the head of the Grand Army of the Republic (GAR) established Decoration Day as a time for the nation to decorate the graves of the Civil War dead. General Logan declared that Decoration Day, later named Memorial Day, should be observed on May 30th of each year. General Logan was raised in Mitchell Lodge No. 85 of Pinckneyville, IL and affiliated with Benton Lodge No. 64 in 1851. General Logan received his 32o in Oriental Consistory, in Chicago, IL, in 1880. He also was exalted in Washington Chapter No. 43, Royal Arch Masons, Chicago, IL, in September of 1885 as well as being knighted in Chevalier Bayard Commandery No. 52, Knights Templar, Chicago, IL, in December of 1885. On September 15, 1886, he was elected to receive the 33o, but died on December 26, 1886 before it could be conferred. Logan Lodge #575 in Indianapolis, Illinois is named in honor of General Logan. Following World War I, the Memorial Day observation was expanded to honor those who had died in all American Wars. Then in 1971, Memorial Day was declared a national holiday throughout the nation. It continues to be observed on the last Monday of May each year. The Month of May also had many significant events that altered the world and one in particular ended six long years of war. On May 7, 1945, (The date of our Stated Meeting on May 7, 2016, 71 years past) Germany signed an unconditional surrender, ending six years of war Europe. This event precipitated, along with other causes, the surrender of the Empire of Japan on September 2, 1945, three months after the German surrender, following 45 months of fighting in the Pacific. As always, our Stated Meeting was a great opportunity for meeting “ole” friends, fellowshipping and brotherhood building. As Scottish Rite Masons, each time we come together is special and as we age in Masonry and chorological age, the opportunity for fellowship takes on a very special meaning and provides opportunities for Masonic learning and remembering. Brother Ernest Runyon, 32nd Degree KCCH, Commander, Council of Kadosh, opened our Stated Meeting in due procedure and welcomed all who attended. The Invocation was given by Brother Leonard Newman, Jr. 32nd Degree, Chaplin, Council of Kadosh and the Pledge of Allegiance was led by Robert Nursey, 32nd Degree, KCCH, 1st Lt. Commander, Council of Kadosh. As we reviewed the past meeting minutes and read the names of our recently deceased Brothers, many contemplated the friendships and memories of those lost. Reading the names of those who have passed gives pause to remember our Scottish Rite philosophy and to live our lives in a manner consistent with our Scottish Rite Masonic values and purpose. During our Stated Meeting Brother Dave Conti, 32nd Degree, presented a review of the 27th Degree, Knight of the Sun, or Prince Adept. As a primer and or reminder, recall the drama of the 27th Degree. This Degree revives the old knightly spirit of chivalry, regard for the virtues in which we believe, and the steadfast defense of duty. The action concerns an applicant for knighthood in the Order of Teutonic Knights of the House of Saint Mary of Jerusalem, founded about 1191. The applicant underwent tests and ceremonies and, in accordance with ancient requirements, was posted on guard before the altar. He was given strict warning that desertion would disqualify him. There then occurred successive temptations for him to abandon his post. He rejected love, defense of his castle, and dire danger to his church. Unexpectedly, a real and furious enemy assault was launched against the city. The outcome was perilously close and apparently only the knight’s fighting leadership could rally the defense. The knight applicant realized the terrible danger to the inhabitants, so he unselfishly abandoned his ambitions, seized his arms, and led the defenders to victory. This was recognized, however, as a sacrifice of self for others and, as a reward, he was knighted and received the deserved title of “Commander of the Temple. Our Stated Meeting was closed in due form and the members reassembled for dinner, salutations and entertainment. Our Dinner program began with introductions by Brother Charles Farmer, 32nd degree KCCH, 2nd Lt. Commander, Council of Kadosh. 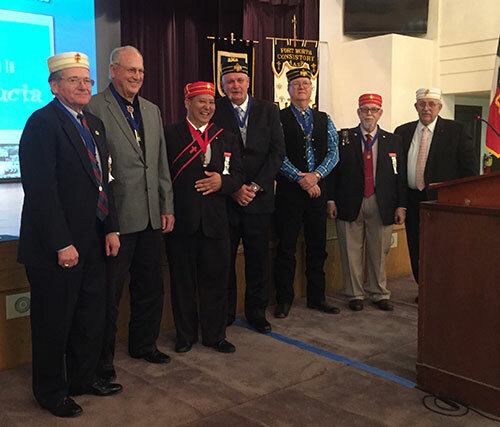 Brother John Karnes, 33rd Degree, recognized Brother Mike Haverland, 32nd Degree, KCCH, for his work as the past Chairman of Membership for the Fort Worth Scottish Rite Valley and for the development of the Patron Knight Awards Program that recognizes Brothers who “sign up” new candidates and new Scottish Rite Masons as members of the Fort Worth Valley. The Patron Knight Award Program is a vital Fort Worth Valley internal program that “walks hand in hand” with “Arm in Arm” and VMAP Scottish Rite Membership Development Programs. Our Chairman and Personal Representative, Ken Curry, 33rd Degree, SSIG, presented a Master Craftsman Award to Brother Jerome Weilmuenster, 32nd Degree. Our special entertainment was a very talented singer and guitarist, Terry Moore. Terry provided the members, wives and guests with memorable songs from music artist past and current. The catered meal was delicious and filling and provided a great time to visit and reminisce of times past and discuss future opportunities in Scottish Rite Masonry. During our Chairman’s remarks; we were reminded of our June 4, 2016 Grand Annual Banquet, Anson Jones Award and the recognition and presentation of Scottish Rite Scholarships to very deserving young graduates. All in all, the evening of Stated Meeting and Dinner was a great time with all looking forward to the June Grand Annual Banquet and the June 16, 2016 Stated Meeting. The Benediction was voiced Brother Leonard Newman, Jr. 32nd Degree, Chaplin, Council of Kadosh. The Dinner and evening was dismissed by Brother Ernest Runyon, 32nd Degree KCCH, Commander, Council of Kadosh.